Keep your cool as summer heats up with the Active Air Portable Air Conditioner, available exclusively from Hydrofarm. Great for bedrooms, and small apartments. 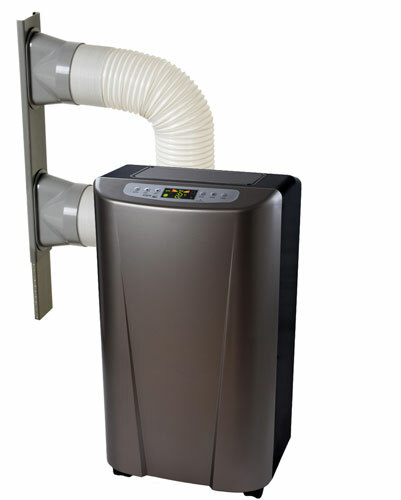 This air conditioner’s portability makes it ideal for people who don’t want to invest in pricey ductwork or central AC installation, and those who require spot cooling between 62 and 95 degrees in rooms up to 500 sq feet, with a standard ceiling height of 8 feet. 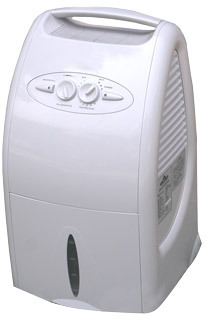 Move the air conditioner on its four sturdy casters and enjoy remote-controlled operation. Because of the use of 1000 lighting systems in your gardening room and the heat that they generate, we recommend these units for indoor gardening areas with no more than two 1000W Lighting Systems and no more than 100 square feet for best use. This unit is a Dual Hose System! When deciding on a portable unit, you'll have to choose between single or dual hose systems. A single hose system uses just one tube to pump hot air out of the building. The trouble is that this reduces the air pressure inside your home. This causes more hot air from the outside to come in through cracks in doors and windows. The A/C unit has to work extra hard as a result, which is a terribly inefficient system. It's not a huge concern if you're trying to cool a small space, and these devices are generally less expensive. For a larger home, though, the extra energy costs can rack up fast. Dual-hose units, on the other hand, cool the hot air that's already inside the house and returns it to the room from whence it came. To keep the unit itself from overheating, a second intake hose pumps in air from the outside to cool the device and then pushes it right back out again. This system is much more efficient because the device isn't constantly working against itself. Dual-hose systems are almost always the way to go unless you only need to cool a very, very small area. This is a “smart” system – its built-in memory function works with all of your environmental controllers (such as Hydrofarm’s new Autopilot line) and timers. Rounding out the features are a built-in condensation tray, window kit, exhaust hose, intake hose, and hose adaptors. Take control of your cool! PLEASE NOTE: This item can only be shipped via truck. It does not qualify for free shipping. Please call for freight quote.